The woman with the gentle smile behind the counter is Mrs. Hisako Uchida. 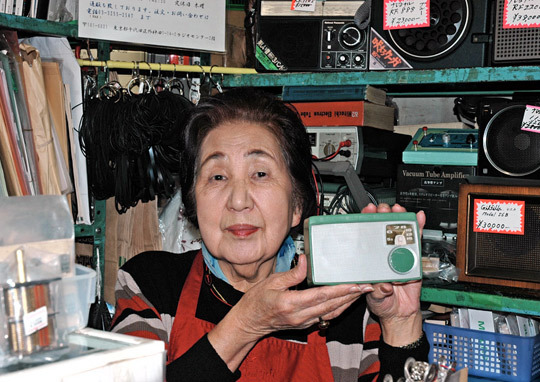 She's the proud proprietor of Uchida Radio, a store located on the second floor of the Radio Center building in Akihabara, (Tokyo's famous "Electric Town"). Home to a number of small shops for roughly fifty close to sixty years, this building was once at the center of the city's postwar radio action. Many of the shops now sell computer parts, peripherals and other high-tech items. 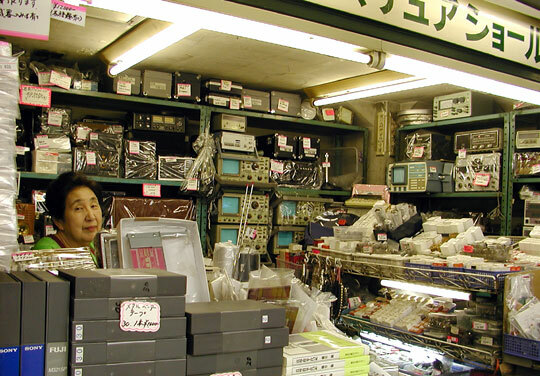 With the exception of some small parts stores, this leaves Uchida Radio as one of the few shops in Akihabara that remains dedicated to selling radio equipment. Mrs. Uchida's husband was quite famous in radio circles. In fact, I've run across an article he wrote about transistors back in 1954 and a picture of him in a leading radio magazine that dates back to around 1955. When Mr. Uchida passed away a few years ago, his wife couldn't bear to see the business he loved so much close its doors. She decided to run the operation herself and continues to give local radio buffs a place to shop, talk, and communicate. Definitely a recommended stop for those visiting Tokyo. 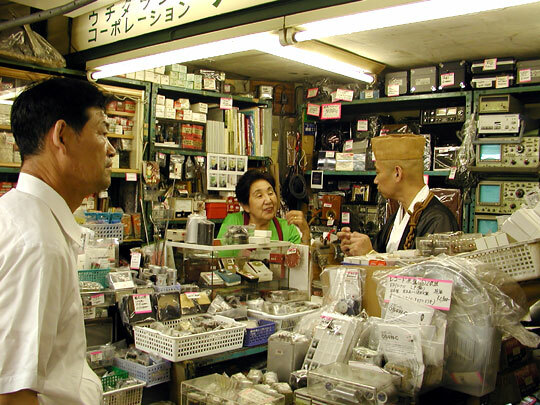 And yes, that is a Buddhist monk in the store shopping for vacuum tubes. The above entry was originally prepared back in July 2001. The face of Akihabara has evolved greatly in the years following, with never-ending rows of high-rise buildings going up and trends moving more and more toward serving the fans of anime, figurines, maid cafés and the likes. Radio Center nears its 60th anniversary and Mrs. Uchida has attained the status of octogenerian. Still, in the face of all these changes, I happily report that she and Uchida Radio remain vibrant and continue to offer radio fans a unique oasis in today's Akihabara. In fact, unique identity that it is, the shop and its cordial proprietor have graced the pages and screens of countless magazines, newspapers and television reports over the past few years. Mrs. Uchida patiently posing for a photo taken on February 23, 2008.
with a steadily increasing number of the same chain stores one finds throughout the city and much of the country. The terribly sad news is that Uchida Radio closed its shutters in the spring of last year. and has graced us with her presence at some of our monthly radio gatherings this year.